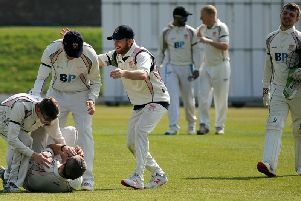 Blackpool and St Annes occupy two of the top three places in cricket’s Northern Premier League and both clubs have earned a reputation for nurturing top young talent. Two of those catching the eye and impressing their peers are St Annes’ wicketkeeper/batsman Richard Staines and Blackpool all-rounder Joshua Boyne. Staines only recently turned 20 but proved his composure under pressure by scoring the winning boundary off the last ball to seal a thrilling three-wicket victory over Fulwood and Broughton three weeks ago, finishing with a season’s-best 62 not out. St Annes head up the coast to Fleetwood tomorrow, hoping to bounce back from successive defeats. Staines was among the top scorers in their losses to champions Netherfield and the surprise setback against Penrith, and is looking to top his best NPL knock of 73 against Barrow in 2016. On top of that, he has 24 wickets to his name this season from 15 catches and nine stumpings. Staines told The Gazette: “It was nerve-wracking needing a run off the last ball against Fulwood and Broughton because I hadn’t been in that situation before and they were a team I hadn’t faced before. “The season has been OK for me personally and for the team. We’re a young team that is improving. “The Penrith game (in which he scored eight boundaries in a 42) was the best I’ve ever felt at the crease. “We never go into a game thinking we should win but we were disappointed to lose that one. Over at Blackpool, Boyne is another player who Fulwood and Broughton won’t forget in a hurry after he scored 64 and took 3-18 bowling off-spin in the Stanley Park club’s six-wicket victory last weekend. Another who won’t forget his contribution is Brian Moore, captain of the hugely successful 1950s Blackpool side, who remains a regular at Stanley Park matches. Poulton-based Brian contacted The Gazette to say: “This lad Boyne really is a star of the future. It was a classic innings and a magnificent all-round contribution. Boyne has 744 runs to his name in all competitions this season, averaging almost 40, and has taken 28 wickets. The bad news for Fulwood and Broughton is they face Staines and St Annes again in the league’s knockout cup on Sunday. Two Fylde coast derbies catch the eye in tomorrow’s cricket programme as Fleetwood welcome St Annes to Broadwater in the Northern Prmier League, while South Shore meet Thornton Cleveleys in the top flight of the Palace Shield. Lytham have lost only once in six Liverpool Competition outings and bid to maintain their fine form at Rainhill in St Helens. Former Palace Shield leaders Freckleton have slipped to fourth after back-to-back defeats and bid to get back on track at home to Rufford. Sunday sees the start of the Northern League’s knockout competition, in which the Fylde coast trio are all away. For Blackpool it means another opportunity to pit their wits against league champions and title rivals Netherfield. Division 1A: Freckleton v Rufford, Fylde v Grimsargh, Kirkham and Wesham v Withnell Fold, Mawdesley v Tarleton, Norcross v Hoghton, Standish v BAC/EE Preston.